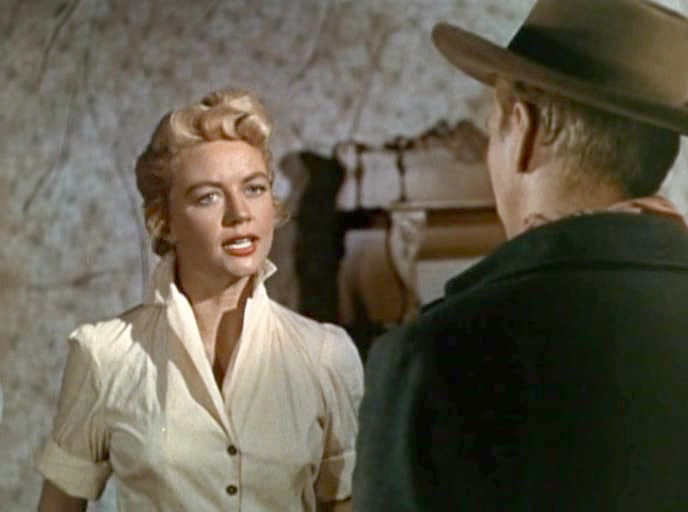 After five years away, a cowboy (Randolph Scott) returns to the town from which he was driven by the rancher father of the woman (Dorothy Malone) he loved. He has vowed to destroy the cattle baron (Robert Barrat), and has found a particularly galling way to do it. But his basic decency and circumstances that he couldn’t have foreseen have the cowboy wondering if revenge is worth it. 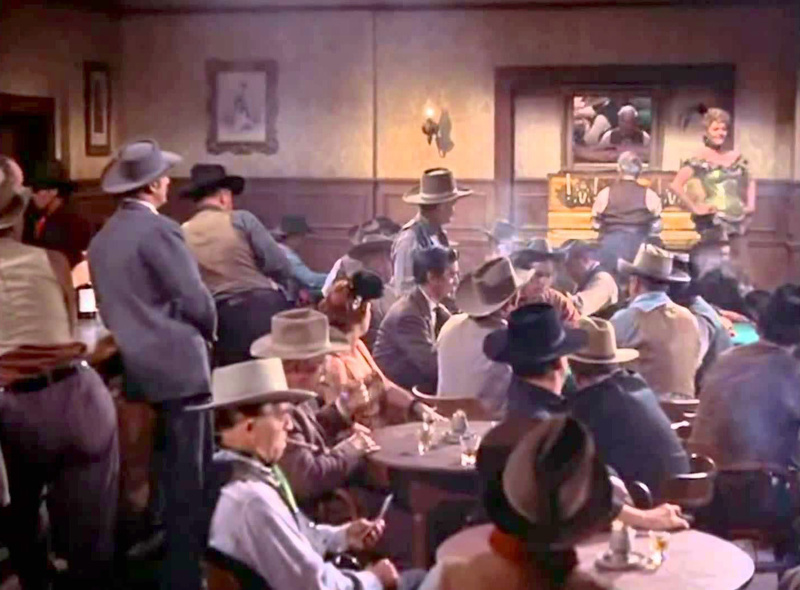 The first half of Tall Man Riding is rather more complex than the story-lines of most westerns. There is a rivalry between cattle-men and settlers that is often seen in the genre, but in this case, the latter seem to be as murderous as the former. But the settlers are taking their lead from a ruthless saloon-owner (John Baragrey), with an agenda of his own, while the rancher is allied with people who are honourable. The plot simplifies itself in the second half, but that is the nature of complicated stories, as they explain themselves. I found the double-dealing and shifting alliances abnormal in a western. Scott plays the stalwart character he often plays, but with a bitterness and angry violence that isn’t usual in his movies. With him, the viewer always knows what he is getting, but there is always a sympathy that he builds with his audience. He is more likeable than John Wayne in westerns, I think, but that may have to do with the unpleasantness in some of the latter's characters, such as in Red River and The Searchers. Scott offers few surprises, but pretty steady entertainment. It’s interesting that westerns frequently offer strong female characters who, despite being socially subservient to the men in their worlds, are quick-minded and strong-willed. 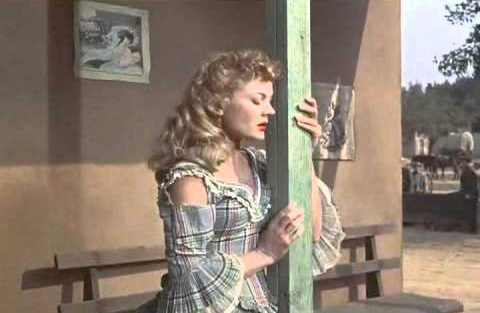 While Malone shows some of that in her character, the more watchable is Peggie Castle (whom Scarlett Johansson rather resembles) as the saloon-owner’s girl. She is playing a double game in more ways than one. While the action is pretty routine, despite a good fistfight scene, the movie benefits from the story and from the performances. 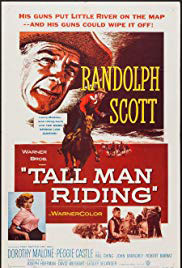 If you don’t like westerns, Tall Man Riding won’t convert you; if you do, you’ll like it more than many. 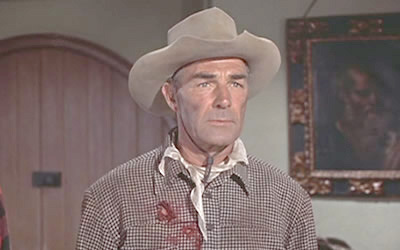 Randolph Scott! I suppose he'll never be remembered as one of film's greatest actors, but he always seemed quite likable, and DANG! but he was a stunner back in the day. Interesting the way the 1950's ALWAYS intruded on the women's pre-1900's fashions.